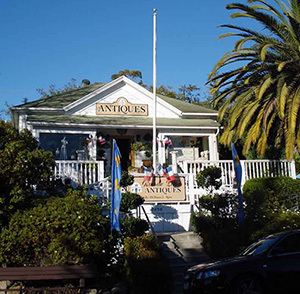 It is hard to imagine a more idyllic setting than the tiny seaside village of Montecito. One of the nation's wealthiest communities, it communicates its grandeur with understated elegance and sublime sophistication. It is certainly an A-list locale without an oversized attitude. With approximately 10,000 residents and 3,000 households, Montecito retains much of its original charm but with the niceties of a contemporary, stylish community. Just east of Santa Barbara, the area is nestled between the sea and the picturesque foothills known as the Santa Ynez Mountain Range. This natural boundary leaves no room for growth or urban sprawl, sustaining high property values and a thriving community. Montecito real estate and architectural styles vary, offering something for everyone—picture-book cottages, elegant Mediterranean villas, luxury oceanfront estates and most everything in-between. Montecito presents discreet, tree-lined lanes, leading both to its grand estates and its bucolic hiking trails. For families, Montecito offers two exceptional public schools and an array of private school options. Exemplary weather (temperatures between sixty five and seventy five degrees nearly year round) allows for abundant outdoor activities such as hiking, biking, horseback riding and surfing twelve months a year! Coast Village Road boasts premiere shopping and dining, with everything from traditional Italian trattorias to authentic Mexican cantinas. Shoppers will enjoy fashionable clothing boutiques, vintage shops and fine home stores, most within walking distance of each other. Butterfly Beach, with its white sand and relaxing ocean breezes is perfect for strolling, swimming, lounging or dog walking. The ideal location to call "home," pastoral Montecito is ever pristine and always waiting. Pierre La Fond: Perfect place to grab a coffee and croissant. Sit outside by the fountain, and let your dogs and kids run around in the park while enjoying your breakfast. Bella Vista Drive between Park Lane and the Romero Trail head: Perfect place for a morning stroll, brisk walk, or jog. Honor Market: Sit outside on the patio, and be sure to try the chicken sandwich! Coast Village Road: Take a peek at Whiskey & Leather, K. Frank, Angel, and Ambiance. Visitors often say that Santa Barbara is the most beautiful city they have ever experienced. It truly has an urban flair yet with the natural beauty one would expect to find in a seaside resort or quaint European village. Santa Barbara real estate features a diversity of residential areas from the Upper East Side’s older, elegant estates, to the Riviera, named after its European namesake, with its winding narrow streets and luxury homes that feature city views. And of course the city prizes its charming beach bungalows and luxury estates with unparalleled ocean vistas. While the city of Santa Barbara and its surrounding areas are breathtaking, its beauty is more than skin deep. It has become a hot-spot for active, community-minded residents who pride themselves on a quality lifestyle, the environment and successful businesses. The diversity of its residents is inspiring, as is the multifaceted nature of all that the city offers. It is as easy to find quality shopping for everything from high-end fashion to camping equipment, as it is to stumble upon one of the city’s four hundred fine restaurants and enjoy a terrific meal. Santa Barbara also boasts one of the state’s top educational institutions, the University of California Santa Barbara (UCSB), and the local airport and easy rail transportation are essential for those whose busy lifestyles keep them on the move. Renaud's Bakery: Perfect for coffee and fresh baked croissants. Handlebar Coffee: Sit on the patio with a coffee and scone. Dogs welcome! Shoreline Drive/Cabrillo Road: Run along the beach on Cabrillo and up to shoreline park for a mandatory pit stop at the swings. Hendry's Beach: Walk along the beach where your dogs can run off leash! Metropulos Fine Foods Merchant: A gourmet food shop with sandwiches that are to die for. Lilly's Tacos: Simple and authentic tacos perfect for a quick lunch. Los Agaves: Amazing Mexican food, and they have three locations! Natural Cafe: Fresh, healthy, and natural ingredients - try the Old Town salad! Santa Barbara Mission Rose Gardens: A beautiful place to picnic with an amazing view of the Mission. Dogs welcome! Santa Barbara Zoo: Home to 146 species of mammals, reptiles, birds, and insects. More than 500 animals are exhibited in open, naturalistic habitats. Pack a picnic and spend the afternoon at the zoo! Sandpiper Golf Club: Watch the sun set over the pacific as you finish up the 18th hole! Santa Barbara Bowl: An incredible outdoor amphitheater that hosts concerts under the stars and overlooking the city. The Lark: A shared dining experience featuring artisanal and seasonal ingredients. Try to sit at the "communal table"! Olio Pizzeria: Casual concept pizza bar/wine bar/full bar. Loquita: Start with the Carpaccio, follow it with the Tortilla Española, and end with the delicious Verdera Paella. Good Lion: Modern cocktail bar in Santa Barbara - follow your dinner with a nightcap here! Carpinteria State Beach encompasses over 4,000 feet of ocean frontage and secluded wooded groves, offering overnight camping in addition to esteemed surfing and fishing. Just a few blocks from the ocean you'll find wide, tree-lined streets with charming shops and restaurants creating an idyllic downtown atmosphere. Carpinteria often showcases parades, craft shows and other events that evoke a gentle way of life. Lucky Llama: Lovely and cozy spot for coffee and breakfast in the morning. Carpinteria Seal Sanctuary: Easy hike that runs along the bluffs. Franklin Trail: A 5.2-mile hike that offers views of the mountains, salt marsh, valley, ocean, and Channel Islands. Nutbelly: Pizzeria and Deli, great for pizza, salads, and sandwiches! Tomol Interpretive Play Area: A great place for kids located in the downtown beach area. Carpinteria State Beach: An excellent state beach for camping, swimming, surfing, and tide-pooling. Lifeguards patrol the beach year round, and seals and sea lions can be spotted December through May. Corktree Cellars Wine Bar & Bistro: Casual place with delicious food and a fabulous wine list. The Palms: If you're looking for a great steak and a fun atmosphere, definitely come here! The Apiary: Cider and mead tasting room with 9 rotating taps of house-made cider. Perfect for after work or a Sunday afternoon drink! Island Brewing Co: Fresh and local beers, what more could you ask for? Hope Ranch real estate includes elegant french country homes, Mediterranean villas, equestrian estates and everything in between. Homes sites were developed to enjoy a variety of views from the landward purple mountains of the Santa Ynez range to the seaward views of the Pacific Ocean and Channel Islands. Governed by homeowners since the 1920s, Hope Ranch prospers from a heartfelt sense of community and concern for the quality of life of every resident. A golf course and country club, small lake, private beach and 22 miles of bridle paths are just some of the benefits of living in this elite residential area.